Industrial production is important to meet our needs and generate employment. 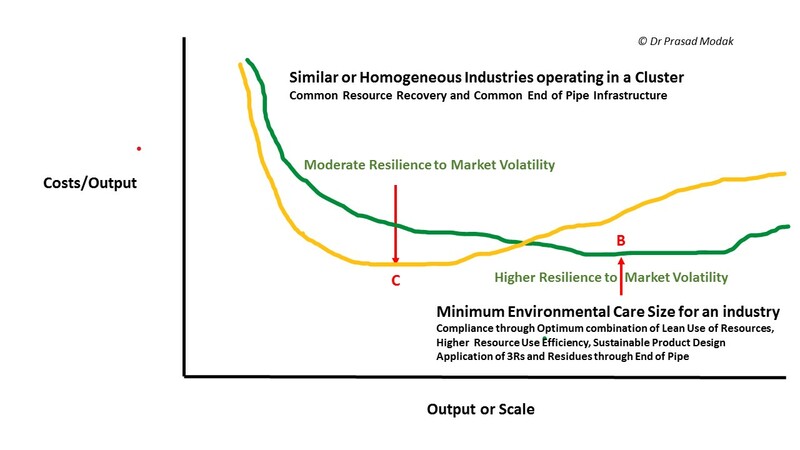 To ensure that the industrial production is economically feasible, the industry must operate above a Minimum Efficient Scale (MES). MES can be computed by equating average cost with marginal cost . The rationale behind this is that if an industry were to produce a small number of units, its average cost per output would be high because the bulk of the costs would come from fixed costs. But if the industry produces more units, then the average cost incurred per unit will be lower as the fixed costs are spread over a larger number of units.In such a case, the marginal cost is below the average cost, pulling the latter down. An efficient scale of production is reached when the average cost is at its minimum and therefore the same as the marginal cost. If we exceed the MES, then the marginal costs may increase due to pressures on product distribution (logistics), additional labor oversight and need for tapping more resources that are not locally available. I was reading on the concept of MES. I told my Professor Friend that Government of India should make a toolkit for all the entrepreneurs to guide on choosing the right MES for their business focusing on the priority manufacturing areas. “Well, you have a point Dr Modak” said the Professor lighting his cigar. “ Perhaps we should train the lenders (bankers) and investors on this subject so that they do not finance industries that are way off from the MES. This could help reduce the Non Performing Assets (NPAs) as well – Professor winked. I liked the term Minimum Environmental Care Size. Could MECS be generally be higher than a conventional MES? Professor smiled when I asked this question. He walked to the white board in his room and drew Figure as below. The Figure was complex but self-explanatory. Many times, industries that operate on the MES are unable to do an environmentally sound or responsible business. Perhaps scales higher than MES allow use of more resource minimal and efficient technologies. 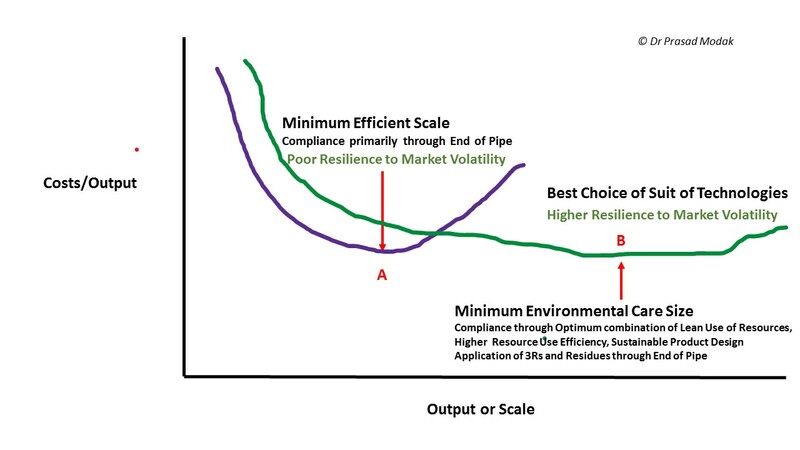 A minimum environmental care size or MECS may therefore be higher than a conventional MES. At this scale, the costs/output would be lower and hence even if the costs of investments may be higher, the overall economic returns will be impressive. An analysis of the cost of production break down between a large forest based pulp mill in India with chemical recovery and an agrobased small mill without chemical recovery has shown that the chemical cost alone is 30% of the total cost of production against a figure of 21% for forest based mills. A decade ago, Indian machinery manufacturing companies have shown that, when the mills reach a level of 100 TPD Black liquor solids, it is viable to set up a chemical recovery plant. Today, this threshold could be lower. Pulp mills of small sizes (20-30 TPD capacity) cannot afford a chemical recovery unit and they would continue to discharge harmful chemicals into the environment. As the society and the State cannot allow continuation of discharge of polluted effluent, either the industry will have to close down or find out alternative methods production to stop pollution or take production to higher scale. This is often not possible due to shortage of finance. When I cited this example on MECS and the challenge of financing, Professor got up and responded while extinguishing his Cigar. “Dr Modak, in such cases, one may conceive a central or common chemical recovery for a number of pulp mills, where Black liquor of individual mills can be collected and processed in a Central Recovery Plant. The white cooking liquor produced in the Central Chemical recovery plant can be transported to the individual mills for their use. Again, the Central chemical recovery unit shall be of a capacity which is technically desirable and is viable financially. In order to make this concept implementable, one must identify a cluster of pulp mills suitably located within an economic zone. The cluster can harbor at least 6-8 mills. The economic zone can be of a radius of 60-75 Km. The Centralized Recovery unit can either be an independent unit or an integrated unit with one of large mills in the cluster. There are advantages and disadvantages of setting up an independent central recovery plant. A recovery plant, independent of the pulp mills, and non-integrated with any pulp mill, must have its own infrastructural facilities, such as water supply, steam and power supply, workshop and laboratory in addition to its own Management. The Management which would control the functioning of the central recovery, is independent of the pulp and paper mill operation. Its function is to procure black liquor free of cost from the mills and in return sell the white (cooking) liquor to them at the market price. It must generate its own steam and power required to run the various sections of the Recovery unit. The extra power can be sold to the State Electricity grid system. Professor walked back to the white board and drew a New Figure as below. I could see potential of this concept for chrome recovery in tannery clusters, metal recovery in the cluster of electroplating industries and spent acid recovery in chemical industries. There will be several such examples I thought that we could use to develop guidelines for key polluting SMEs. Indeed, we want to see more of Make in India but on a scale that will ensure environmentally and socially sound production – I decided to bring this topic to the attention of MoEFCC and Central PCB when next in Delhi. On a second thought, I thought that it should be the job of the Niti Ayog (India’s earlier Planning Commission). They are the Gurus and can bring in a change at national level. September 5 is known as the Teachers Day in India. Teacher’s Day is marked in honor of Dr Sarvepalli Radhakrishnan, who was born on September 5, 1888. Dr Radhakrishnan was India’s first vice president and second president. He was a great scholar, philosopher and recipient of the prestigious Bharat Ratna . Since 1962 – the year he became president – India has commemorated Dr Radhakrishnan’s birth anniversary by paying tribute to its teachers and gurus on this day. On this day, all “students” pay respects to their teachers who have guided and shaped their lives. I went to see my Professor friend on the morning of September 5. When he opened the door and let me in, I touched his feet seeking his blessings. “Oh, Dr Modak, why this?” He exclaimed. He was clearly embarrassed. “Well Professor, these conversations have indeed been quite some teaching to me” I said with all the gratitude. We then spoke about our teaching experiences and shared anecdotes of some of the inspiring teachers and outstanding students. “Tell me Dr Modak, why do we conduct an assessment at all?” Professor asked me taking a deep puff. I thought this was a rather too basic question to ask. But I put forth several reasons as below. I was surprised. I had never thought of this 6th reason for the assessment. I remembered Professors in IIT Bombay where I studied. We had some Professors who used to set real tough question papers to gain a kind of “reputation”. They were called – as “homos” – as most students used to get “screwed” during the assessment. Some Professors used to set very lengthy questions where the speed of thinking as well as writing mattered. These professors used to smile when most of us used to beg for extra time. The answer books used to have 4 to 5 supplements! Some Professors used to give us an Open Book examination where we could bring our books and “cog” sheets. The “solutions” to the questions in the paper were however never found in the books. Some Professors used to go even one step ahead. They used to allow us to take the question paper to the hostel and take help from our seniors if we wished. A weekend used to be given to come back with the answer books. But, the questions asked were so difficult and different – perhaps coming from the “outer space” and so we used to urge the Professor to set a standard, conventional and time bound question paper. So, Professor, what is the “science” of question paper setting? I could not hesitate but ask. For the below average case, put 20 marks on the “objective” questions (like TRUE/FALSE but with WHY? ask for match making, correcting a flow chart or filling gaps in the flow chart can be another example– e.g. in industrial manufacturing flow sheet, wastewater treatment process etc.). Keep remaining 20 marks for questions that ask for half page to one page write up or explanation but asking for EXAMPLES. Give multiple options to choose the topic here. For the medium lot, reserve 15 marks for some computational work oriented to problem solving. The problem should however require a need to make ASSUMPTIONS. So, don’t provide complete set of data. Keep the remaining 15 marks for a comprehension type of question where you give a page of text to read and ask questions where there are no easy answers e.g. what should be preferred choice of disinfecting wastewaters prior to discharge or is GMO the solution to address the problem of word’s food security? When Professor saw me taking notes, he paused. “Well Dr Modak, you don’t have to follow my “rules”. 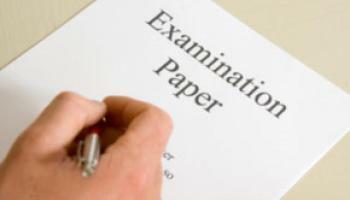 After all, remember setting a question paper is both science and art”. I was thinking how many Professors think of this science and art of question paper setting? How much time and importance do Professor give to this important aspect of “teaching”? I thought this was a new learning and realization for me on Teachers day. While reaching me at the door, Professor whispered “Well, we just talked about structuring the question paper – Dr Modak but there is also a science in sequencing/ordering or mixing the questions – we never pose the questions in the hierarchy of below average, medium and top-notch students. The “finale” is a carefully designed “ladder” with well laid “traps” – giving a student an experience of an uneven ride! Only the bright ones do page reading of the question paper and decide the sequence in answering! I felt rather lucky that I did not formally take a course with Professor and appear for his exam. “Professor, could we take a project of compiling some of the best crafted question papers/assignments in the subject environmental management? Teachers of today need to know” I said while walking down the staircase. In 1984, I went through a 5-day rigorous training at IIT Kanpur in India on how to set question paper for the famous IIT’s Joint Entrance Examination. It was a memorable experience. To my knowledge, this kind of training did not happen later. Pity.